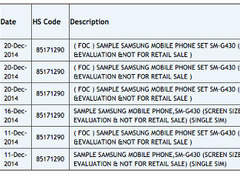 According to a new leak, Samsung is working on a new mid-range smartphone codenamed SM-G430. The handset is expected to come with a 5.5-inch 1080p display and a Snapdragon 801 chipset. Although Samsung officials stated that the company will release fewer smartphone models in the future, it looks like the South Korean manufacturer is still working hard to cover every segment of the market. 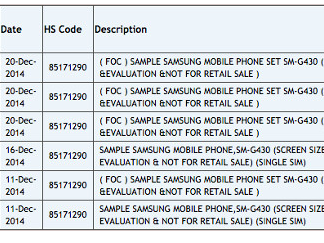 Alongside the Galaxy S6 flagship, the high-end Galaxy A7, the new mid-range Galaxy E series, and the entry level SM-J100H, a new leak indicates that Samsung is also working on a upper mid-range smartphone codenamed SM-G430. A fresh leak reveals some interesting specifications for the upcoming Samsung SM-G430. The smartphone is expected to come with a 5.5-inch display running a fullHD resolution and a Qualcomm Snapdragon 801 chipset. These specifications are not what one would call mid-range, seeing as most of the 2014 flagships were based on the same configuration. If this info turns out to be accurate, the Samsung SM-G430 would have the specs to take on devices such as the Xperia Z3, the HTC One M8, and many other current-generation flagship smartphones. At the moment, it is unknown if the Samsung SM-G430 will come equipped with a metal frame like the Galaxy Alpha or the Galaxy Note 4. If this really is a mid-range device, chances are that Samsung might decide in favor of a plastic build in order to keep the price down. While the leak doesn't provide any information regarding the official unveiling of the Samsung SM-G430, expect the smartphone to be introduced at MWC 2015 in early March.